While I enjoyed the first book in this series, I was interested in this because of the differences between Piper and Jase and how a relationship between them would play out. Piper Ross is the quintessential princess, born with a silver spoon and privy to the best that life has to offer materially, except for what matters most: loving parents. With a critical and overbearing mother and a father who ignores her, Piper has found her own family in her best friend, Rowan and Rowan’s brother Jase. But Piper has been in love with Jase since she was a teen and even his stint in jail does not discourage her feelings. Watching the constant parade of women in his life has her determined to make her move finally and she does so by moving into his house as his roommate and working with him as his office manager. Just out of jail, Jase Simmons is trying to get his life in order without any more drama, which having Piper around him are sure to bring. Not because he doesn’t like her, but because he likes her too much but he also knows that Piper is beyond his reach and he can’t offer her anything. Piper is from a wealthy family and is a good girl, but a lot more inexperienced than the women he usually gets involved with and worst of all, her father is the police chief and is sure to take issue with his daughter getting involved with an ex-con. Well, none of that matters when Piper finagles her way into his life by working and living with him, making his decision to keep his hands off her even harder. Piper is so sweet, the kind of sweet that can make your teeth ache, so her act of rebellion – moving out of her parents’ home – was a welcome one and when coupled with her making a bid for Jase, showed that there was some backbone under all of that buttoned up sweetness. And Jase. His rejection of Piper was really his way of protecting her, misguided as it was and when he finally accepted that she was interested in him for real, he treated her like the princess she really was. On the outside Jase may have all the trappings of a bad boy, but on the inside he had a big heart and his gentleness and softness with Piper was so sweet. He even brought out a whole new side to Piper, who went from mousy and meek to confident. A bad boy who falls hard for his woman is hard to resist and Jase’s hardened edges mellowed with Piper in his life. I like that after they got together, they both accepted what was happening between them and didn’t focus on their differences but on making what they had work. The only major drama came from Piper’s parents and their attempts to control Piper and separate them. 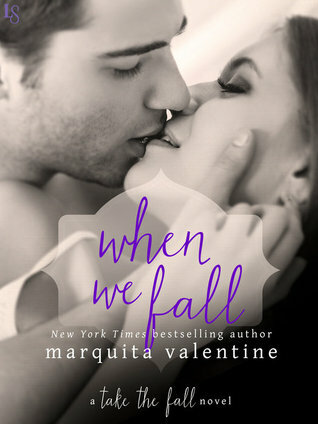 WHEN WE FALL was a pleasant read, with just enough angst and drama and two very different people finding common ground in their feelings for each other. I have to say that I liked Rowan here more than in her book. She was very supportive and protective of her best friend and may have been the driving force behind Piper’s bold decision to fight for Jase. Recently, Marquita signed a multi-book deal with Penguin Random House that will debut in July of 2015.